Sometimes I really think I just never change. OMG I EARNED THAT BADGE!!! And undoubtedly have a thousand times over in the years hence. I do believe a box in the basement contains many of my old Girl Scout (and Brownie!) badges. If I still have it that sucker is getting sewn on my jacket TOMORROW. I had that Trapper Keeper! Different additional stickers on mine, though. [grin] What is the badge for? Computer skills? I assume so! I have no recollection of what I did to earn the badge, though. Something in Basic, if I had to guess. I had that badge, too. But, given that I was a halfway-competent BASIC coder before the age of 10, I felt kind of lame, like I was asking for a badge for breathing. 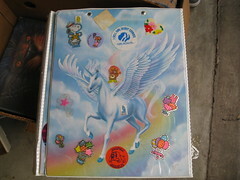 oh MAN did we all have unicorn and pegasus and unisus/pegacorn pictures? I think the reasoning is really, if you have wings and a horn available, why should you have to choose? We really felt we could have it all in those heady days. Professor Nicolas is pointing out salient information! I wish! 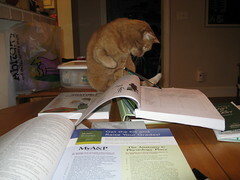 No, he just wants to take all my writing implements. Which he can't use, because he has no thumbs! Stupid monkey! Behold the hidden shadow power of the Girl Scouts. I hope for your sake that your parents don't have as much crap in their attic for you as mine do! I did have my sash for a long time, and I might still. I just have no idea what box it would be in! So, is there a significance to 7,19? the girl scouts were founded in 1907? i dunno. I did some geeky embroidery this winter, so I'm getting pretty fast at reading it. 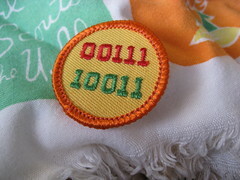 Needlework and binary must be the greatest synthesis of scouting skills ever! I threw away my sticker book in one of my cleaning fits. Now I miss it. It had bears on it, but a lot of unicorn stickers inside. I really didn't have time - come down one day and went back the day next. :( I am sorry!